You don't have to speak Spanish yourself or have relatives that speak Spanish to teach your little ones. Many parents have expressed to me lately how much they wished they spoke Spanish because they want their kids to be bilingual. With the economy the way it is and with jobs being so hard to find, they want to give their kids an early advantage and get them interested in the language early on so they maintain it and continue learning it through elementary, high school and onto college. Well, I always tell them that they don't need to speak Spanish themselves in order to teach their kids. 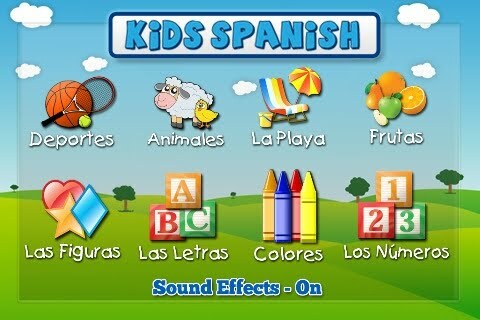 There are tons of resources, most of them free, to teach their kids Spanish at home. Below are some examples, along with some ways to make your home a bilingual one. The whole family can learn together! Nickelodeon's Nick Jr website offers games, activities and printables to help your child learn words in English and Spanish. Perfect for young preschool or kindergarten age children just starting with the language. This is an excellent, comprehensive website for parents and kids of all ages to test their Spanish and learn it at any level. It features tons of free activities including memory games, vocabulary, alphabet sounds, children's videos, songs & lyrics, spelling practice, conversational Spanish to speak with friends, age appropriate activities, worksheets and more! The site also has sections to make your own flashcards, puzzles and even a section for Spanish teachers that you can check out. It also has a "Test Your Spanish Level" section to estimate yours or your child's level of fluency in the language. For older children, it has a Verb Conjugator section to help with the most difficult part of learning the language. Simply enter the word and it conjugates the verb for you. There's also a Spanish/English Dictionary, Text Translator and Sentence Maker. Excellent learning or tutoring resource! What more could you ask for and it's free!! This website features specific lessons on all of the major Spanish topics, including music and literature. It's ideal for high school age children or children that already speak the language and want to learn to read and write. The site features audio samples, quizzes, musical audio and more. It also allows you to subscribe to a free email newsletter so you can get notification whenever new activities are posted. Some of the lessons include people identifiers, question words, verbs, masculine and feminine words, days of the week, months of the year, imperfect verbs and much more! In order to enforce lessons at home, it may help to label items all around your house in Spanish and English. Simply write the words on 3 x 5 cards or Post-It notes and tape them everywhere such as on chairs, windows, doors, appliances, etc. You can also type them and cut them out to make all of the letters look exactly the same and encourage font recognition. Practice the words when eating, bathing, playing, etc by asking your child what it is and having him or her tell you in both English and Spanish. You can also make Spanish/English bingo games, flash cards, memory games and more! When your child draws pictures, see if he or she can draw items that he knows the Spanish words to so he can tell you what it is in Spanish. When asking for something, have him or her say Please and Thank you in Spanish as well as English. Simple tasks such as these and using the online resources will help your entire family learn the language and quickly spark an interest in your little ones so they keep learning it through childhood and into college!